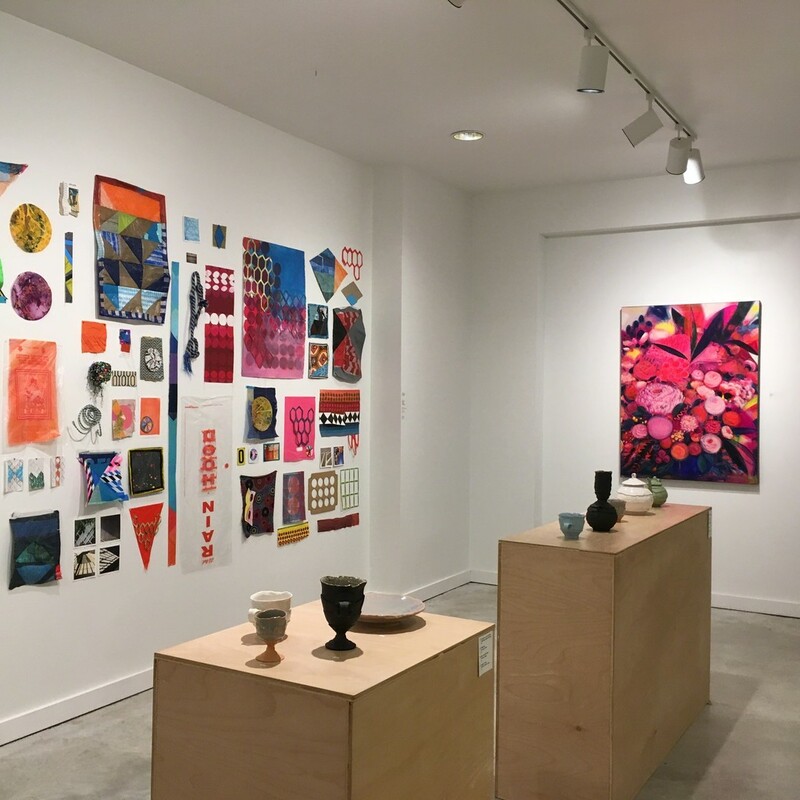 August exhibition featuring paintings by Amy Soczka, textiles by Tim Abel, and ceramics by Justin Donofrio. "I am interested in creating work that is like a memory of a landscape or a garden that you dreamed about. I like to experience art up-close, to study the marks and the hand of the artist. When I paint, I want to be inside of the canvas, in between the layers of color, surrounded by the sometimes hyper imagined flowers and leaves. I often let my eyes lose focus and work through the painting, excusing the details in favor of color and movement." "My current series of large paintings attempts to surround the viewer with a wall of saturated florals that are familiar but imagined, an impossible arrangement, the result of my own meditations." "RepeatPatternRepeat" will use the gallery to showcase a collection of works that attempt to find temporary order in this constant motion. 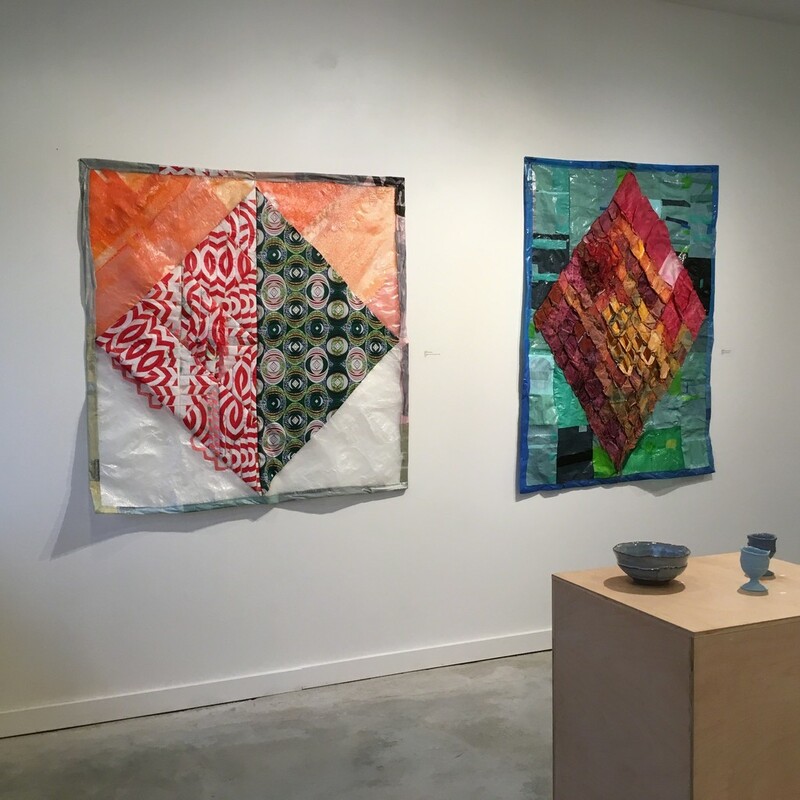 Large wall-based sewn plastic works, works on paper, site-responsive paper-based installation, accumulated small works and ephemera will create a richly colored, patterned and layered visual environment. These works embody the ritual of searching for order through the act of gathering and making; finding a vocabulary of order by translating found pattern from natural and man-made structures ranging from traditional quilting patterns to geology maps to honeycombs." "Through the lens of functional pottery I focus on questions about our relationship with objects. The geographical layered strata of each vessel represent fragments or glimpses into the density of every assemblage. Each vessel is made using clay that is artificially colored to reference natural tones. The juxtaposition of the natural and artificial speaks to a notion of manicured space in an attempt to cultivate order." "Focusing on the fluidity of process and materials as remnants of making, I work with a limited number of tools and movements to allow the clay to actively inform the line quality and elegant volume. Relying heavily on the physicality of the technique I generously push and pull these lines to develop an undulation that resembles natural rhythms. The harmony of repetition comes through meditation of movement. The presence of process in the work is essential as my forms are searching for confidence in their construction. 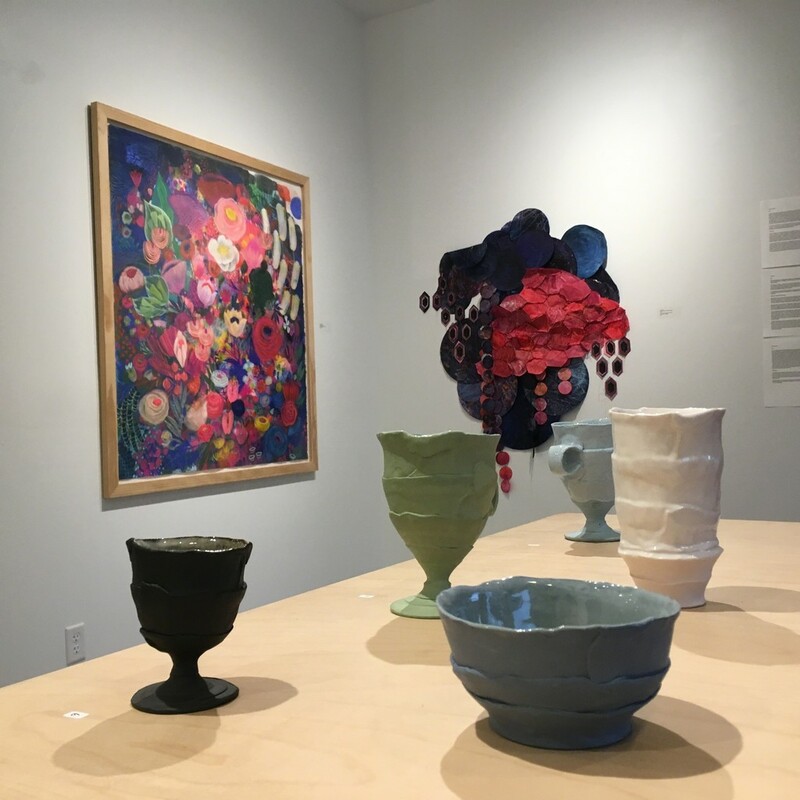 The conversation between the stained clay and glaze, obscuring or revealing, explores a didactic look at color as body and color as skin."